Anatomy of a round diamond is the first step towards diamond education. A Diamond is one of the best known and precious gemstone in the world. Each part of a diamond has a specific name and its fundamental study is essential to understand the diamond as a whole. 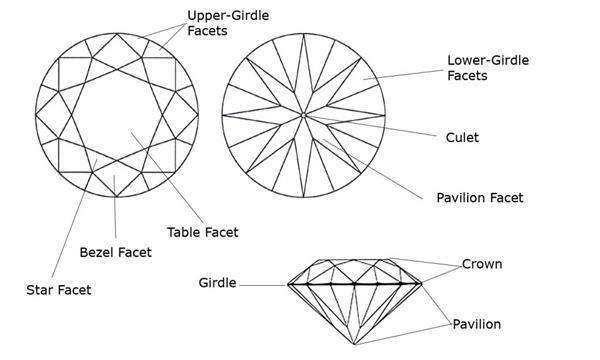 The basic parts in the diamond anatomy are: Facets, Crown, Table, Diameter, Pavilion, Girdle, Depth and Culet. FACETS: Facets are basically the flat faces on the surface of a diamond. A diamond facet is any smooth cut edge on a diamond. Cutting a diamond with symmetrical facets contributes to its brilliant and shine. DEPTH: The height of a diamond from the culet to the table. It is measured in mm. DIAMETER: The width of the diamond measured through the girdle. It is measured in mm. CROWN: The upper part of the diamond above the girdle. The Crown angle in the well-cut diamond should be 33 to 35 degrees. It consists of a large flat area on top called a table, and several facets below it (star, bezel and upper girdle facets) forms the parts of the crown. Upper Girdle: It is the lowest facets on the crown Facets and just above the girdle. PAVILION: Includes the lower part of the diamond below the girdle. Lower girdle facets, Pavilion facets and culet forms the parts of the pavilion. Lower Girdle Facets: The highest facets on the pavilion and it is right below the girdle. 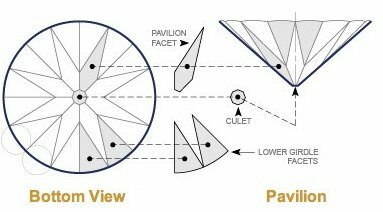 Pavilion Facets: Elongated facets and closest to the culet. Culet: Small Facet at the bottom of the pavilion. Graded “none”(Pointed) or “small”. 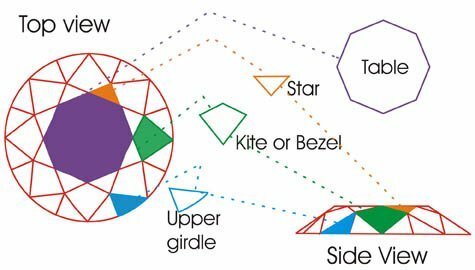 So, This was the basic understanding of the parts of a round diamond which is the first and foremost requirement to study about a diamond. Understanding anatomy of a round diamond is essential. We hope this article helped to gain basic education about different parts of a diamond. Got question? 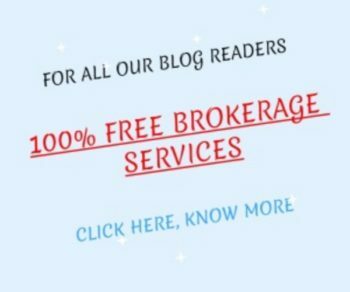 comment below, we would really love to help you. What is taliyu, mathalu, pel, ghat, single no hero, double no hero..? You mentioned here is Gujarati (Gujarati is an Indian regional language) terms related to diamonds. Hope that was helpful. Good Day.